No reason behind today’s rough sketch. Some coffee stains on a crinkled piece of paper. Last sheet in the pad. Didn’t like the feel of the pencil on the paper. I’ve been trying these Bic Pencils but they’re a shade harder than the old reliable PaperMate pencils. Got frustrated and just blew off the cat’s rear legs. He’ll deal with it, dragging himself around where he needs to be. 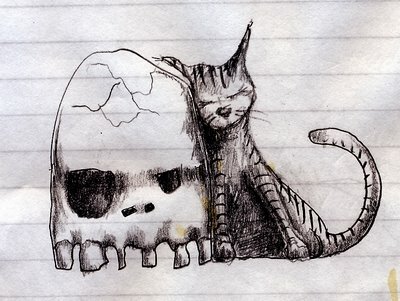 This entry was posted in cat, drawings, skull. Bookmark the permalink.